Did Netflix really put Blockbuster out of business? 2007: Blockbuster brings in 7-11 execs to focus on “package” customer leaves store with (candy, cokes, etc. )1997: NF founder returns Apollo 13 to BB 13 weeks late, dismayed by his late fees, he starts his own company. Blockbuster was hurting long before Netflix became a player. But it looks better to lose a war, than to lose from sheer incompetence. 1997–Reed Hastings returns Apollo 13 to Blockbuster 6 weeks overdue, and is dismayed by the $40 late fee. 2000–Blockbuster declines to purchase Netflix for $50 million. Creates 20 year deal to deliver on-demand movies with Enron Broadband Services, subsidiary of Enron. 2001–Enron files for bankruptcy, in accounting scandal. Blockbuster kisses streaming deal goodbye. 2002–Blockbuster posts $1.6 billion loss. 2003–Netflix posts first profit of $6.5 million. 2004–Blockbuster enters online DVD rental market. Reed Hastings tells analysts “in the last six months, Blockbuster has thrown everything but the kitchen sink at us.” The following day Hastings receives package from blockbuster: a kitchen sink. 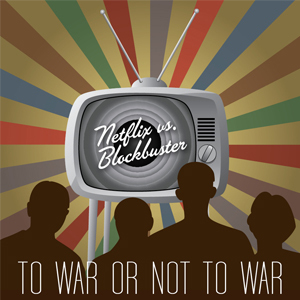 2005–Blockbuster launches “no late fees” campaign. Is sued for misrepresenting policy to customers. 2006–Blockbuster surpasses 2 million subscribers for online services. Netflix reaches 6.3 million. 2007–Blockbuster loses 500,000 subscribers just in the third quarter. 2009–Blockbuster rolls out kiosk system designed to compete with Redbox. March 2010: Blockbuster advertises 28 day quicker access to new movies than Netflix. Reintroduces late fees. July 2010: Blockbuster launches Droid X app. Blockbuster de-listed from the NYSE, shares at all time lows. September 2010: $1.1 billion revenue losses, with a company value of just $24 million–Blockbuster files for bankruptcy. Netflix didn’t shut down Blockbuster, but they did steal the market Blockbuster needed to move into. To satisfy entertainment needs, showing massive early adopters to digital delivery. After Blockbuster dug its own grave, Netflix’s 40 million customers are forging into a new era of entertainment.